Premoistened towelette instantly reduces the visibility of stains. Cuts grape juice, coffee, blood, baby formula. Premoistened towelette instantly reduces stains. Cuts grape juice, coffee, blood and baby formula. Pretreat stains on clothing—even during wear. Safe on colorfast washable and dry-cleanable fabrics. Convenient and portable. Individually wrapped. 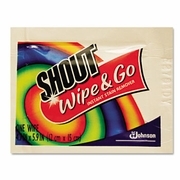 4.7 x 5.9 towelette. Box of 80 Packets. FREE SHIPPING ONLY TO THE US CONTIGUOUS 48 STATES. no po boxes.